The Division 2: A look at the six districts of Washington D.C.
Get a glimpse of Washington D.C. in the upcoming open world shooter The Division 2, which contains six districts and a map roughly 20% larger than the previous game. Earlier this week Ubisoft gave players in Japan a glimpse at some of their upcoming titles with Ubiday 2018. 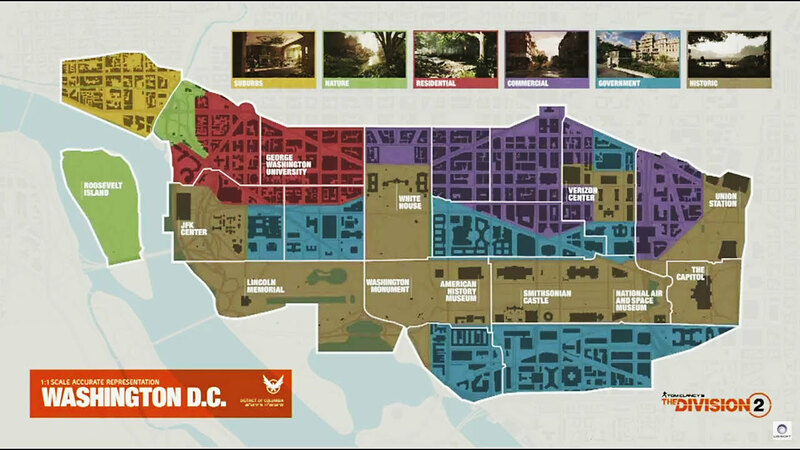 During the prestentation we were given a look at the open world of The Division 2 with a look at Washington D.C. and the various districts included within the game. With the sequel they wanted to provide a smooth transition between each one to allow a more organic experience while exploring the world. In The Division 2 you'll be able to see some popular locations such as The White House, and see other famous places since the game offers a richly detailed world map with some faithfully recreated spots from the US Capital. For The Division we got a detailed version of New York, so expect to see the same attention to detail in the upcoming sequel with a larger map that is roughly 20% bigger than New York. Additionally it's been revealed that the single player experience will be given higher priority than it was in the previous game, so if you're not wanting to interact with people in group activities you'll find something to do solo. Whether that's hunting for better equipment or exploring the world. Ubisoft have also promised a more detailed story that will provide greater immersion. The Division 2 launches on March 15th 2019, or 3 days earlier with the Gold/Ultimate Editions of the game. Pre-order any version of the game to get bonuses including access to the upcoming Private Beta!